← Patrick Henry: Why Didn’t Anyone Listen to Our Most Passionate Proponent of Liberty? I wanted to touch on something, as you already probably know, that had me really upset over Thanksgiving. And that was Obama’s failure to acknowledge and thank God in his Thanksgiving message to the nation. I think we are witnessing something that our Founders warned us about ….. A government which is growing HOSTILE to religion. This is something that our founding settlers devoted their lives to and the one issue above all else that Thomas Jefferson devoted his public service career to – the notion that we all can worship and embrace the rights of conscience without the government prohibiting “the free exercise thereof” and without establishing a government-sponsored form of religion which creates hostility towards other denominations. As lovers of liberty, Tea Party members, and constitutional warriors, we know this and it kills us every time we hear public servants and activist judges cite the phrase “Wall of Separation.” We know that activist judges created a legal fiction out of this phrase, and most offensively too, by claiming it was Jefferson’s very own concept. They indeed used his own words, out of context, against the very freedoms he sought to protect. 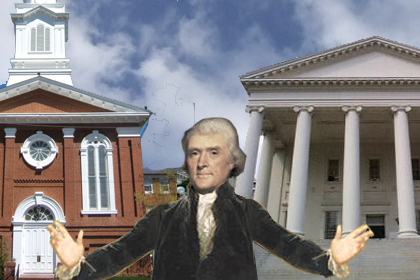 Jefferson, by his own wishes, wanted to be remembered as the Father of Religion… the man who secured the rights to free exercise and the right to be secure in one’s own religion such that the government wouldn’t establish one religion and punish a person for allegiance to another faith or denomination. When atheist groups such as Freedom from Religion, which represent less than 1% of the population, can sue to remove a religious artifact or a prayer or a word/phrase, they are suing because “It makes me uncomfortable to hear the prayer.” “It makes me uncomfortable to drive past the town square and see a nativity scene.” So what does the court do? It requires the prayer to be removed. Sometimes it requires the prayer to be so altered that it lacks religious significance and ends up being a pep talk. It requires nativity scenes to be removed and crosses to be taken down. In essence, the court is choosing NO RELIGION over religion. And that makes the current population of Christians in this country – 85% (according to a 2011 census) – and other believers very uncomfortable. It makes us uncomfortable because we can’t recognize the proper religious implications of a holiday and it makes us uncomfortable because we know that government is becoming increasingly hostile to the rights of religion and rights of conscience. In particular, it makes us uncomfortable because the government is becoming increasingly more hostile to us and to those who think like us. Liberty is becoming more fragile. I write this as a plea to keep the pressure on public officials to respect the exercise of the Christian faith. We’re not demanding that the government establish it as a national religion but we will not tolerate the hostility of the government to this very religion which was so instrumental in our founding and is so clearly evident in the words and spirit of our Declaration of Independence and our Constitution and our state constitutions. We all, including atheists and yes, even liberals, depend on the very freedoms that our founders secured for us. It is sheer hypocrisy to hear people, like Obama and Freedom from Religion groups, use the very freedoms that our reverent fore-fathers secured for us, based on religious principle, to destroy other fundamental freedoms. For those who have taken the time to study our founding history and turn to primary sources rather than nonsense put out by groups such as the Southern Poverty Law Center, we know that once our founding patriots fought the American Revolution to win our independence from Great Britain and secure the blessings of individual liberty for Americans, our early leaders had to figure out how best to protect those blessings for future generations and in fact, for posterity. Every generation of American deserves the full promise and exercise of freedom that our early Americans fought, secured, and protected. Our early leaders, those men we fondly, humbly, and proudly call our “Founding Fathers,” drafted a Constitution for that purpose. The task falling to them was how best to secure those liberties. They did so by basing our founding documents on certain philosophies and values that they knew would enlarge liberty rather than limit and endanger it. There were many philosophies floating around at the time. After all, the European Enlightenment Era (ie, the “Age of Reason”) beginning at the start of the 18th century (1700) to about 1800, produced many theories to explain social institutions and human behavior. This movement advocated rationality as a means to explain an authoritative system of governance, as well as to explain the basis for ethics and morality. Up until this time, theories were based on the writings of Plato and Aristotle. Plato believed that the State should establish an ordered society; that it should solve all society’s problems. Consequently, he believed that individuals only role was to serve the interests of the State. They have no rights, just duties. Aristotle, his student, did not agree. He believed the individual was more important than the State and the latter cannot be trusted to solve all of society’s problems. He did not believe in a utopia, and certainly not one that the State would create. He believed that the fundamental rights of life, liberty, and property should not be surrendered to the State because it would destroy the benefits that such rights create. The Enlightenment philosophers, like John Locke, William Blackstone, Thomas Hobbs, Montesquieu, and Adam Smith, offered the Natural law rationale behind the type of arrangement that Aristotle taught, with respect to individuals and their government. Our Founders could have adopted any of the philosophies floating around at the time, including those of Plato, in establishing the foundation for our nation, but they chose those that embraced individual liberty and the protection of fundamental rights. Our Founders were grounded in the teachings of the Bible and therefore sought the best form of government for fellow Americans, the one that would embrace freedom and promote the best and noblest pursuits and ambitions of man. They understood that when the best and noblest ambitions of man are promoted, all of society benefits. The French, on the other hand, sought “Equality of Outcome’, rather than “Equality of Opportunity.” In a society that is based on Equality of Opportunity, as we are (or were) under the Declaration of Independence and Bill of Rights, there is an equal opportunity for all individuals to maximize their potentials and attain positions in society. This is made possible by equal protection of rights and equal access to things like education, the intellectual arts, and contracts. Equality of Outcome refers to a state where everyone receives equal amounts of rewards and an equal level of power in decision-making, with the belief that, no matter who contributes more, no one should be rewarded more than another. There are atheist groups who challenge our Founders and the Constitution and say that they indeed intended to create a secular state. They point to the wording of the Constitution and the lack of any mention of God in it. This view evidences an astonishing lack of understanding of the federal nature of the system unanimously created by the delegates at the Constitutional Congress of 1787 and endorsed by the States in their ratifying conventions. The failure of the Constitution to mention “God” or provide for His acknowledgment has nothing to do with the intentional creation of a secular state; in fact, the Constitution has nothing to do with religion at all except to forbid the federal government from interfering with an individual’s rights to recognize and worship the religion of their choice. The Constitution was silent on the subject of God and religion because there was a consensus that, despite the framer’s personal beliefs, religion was a matter best left to the individual citizens and their respective state governments. Simply put, the Constitution appears “godless” or secular because in so doing, there was an intention decision to leave all matters regarding religion and devotion to God to the individual States. As we can easily confirm, relationships between religion and state and local government are defined in most state constitutions. Our Founders and Framers, in the pursuance of the greatest freedom of Americans to worship, believed it would be inappropriate for the federal government to encroach upon or usurp state jurisdiction in this area. State and local governments, and not the federal regime, were the basic and most fundamental political units of the day. Thomas Jefferson, father of religious freedom in the United States (and I mean freedom to worship and NOT freedom from religion), envisioned that there would be two documents in every house… a Bible and the US Constitution. The first would teach Americans how to have a servant’s heart and the other to inspire them to step up and serve their country. In our young nation, the Bible was used as a text book for the purpose of teaching children moral principles to live by. As time went on, the Bible was gradually replaced by other text books such as Noah Webster’s Primer. Webster’s Primer taught children to spell but was also filled with moral Bible verses. In the front of this book was Mr. Webster’s picture, accompanied by the inscription: “Noah Webster, who taught millions to read but not one to sin.” Webster’s Primer was eventually replaced by public school textbooks. From the 1960’s on, the federal government (through the Supreme Court and then, in the late 70’s, by the US Department of Education), removed religion, morality, and ethics from its curriculum. The consequences of those decisions quickly followed, as teenage pregnancy, crime, lack of discipline, and disrespect for authority quickly rose. It used to take a “community to raise a child,” but now that community is destroying children because the federal government demands that religion and morality take no part in that rearing. The government is slowly eroding our religious rights. Perhaps the more accurate statement is ‘Government is quickly eroding our religious rights.’ The First Amendment guarantees that “CONGRESS shall make no law respecting the establishment of religion OR prohibiting the free exercise thereof.” The First Amendment only proscribes conduct by the federal legislature. That is all. In fact, the First Amendment proposed initially by James Madison read: “The civil rights of none shall be abridged on account of religious belief or worship, nor shall any national religion be established.” The Supreme Court, a branch of the federal government, has incorrectly interpreted the First Amendment. Our former Chief Justice, William Rehnquist and our current Chief Justice, John Roberts, both have publicly acknowledged that the Court got that decision wrong and the “Wall of Separation” has no place in constitutional jurisprudence. Yet the uninformed American people and even members of the media were quick to jump all over Christine O’Donnell, senatorial candidate from Delaware, in 2010 when she correctly noted in a debate that nowhere in the First Amendment do the words “Separation of Church and State” appear. Even lawyers and constitutional groups criticized her for not recognizing the phrase as “Jefferson’s summation of religious rights.” I guess rights and liberties are in the eyes of the beholder. The two clauses of the 1st Amendment right of Religion – the “Free Exercise” Clause and the “Establishment Clause” – exist in a delicate balance. If the government regulates too heavily under the Establishment Clause, it necessarily burdens the Free Exercise Clause, which is just as important and sacred. And this is exactly what we are seeing. The federal government is burdening our free exercise of religion. It is forcing us to worship at select times and places – such as our homes or in churches. Government is forcing us to be “neutral” and in denial when we are on public property, on public time, or acting in a public capacity. The US Congress may not have “established a law prohibiting the free exercise of,” but the Supreme Court, under its illegal judicial activist power, has achieved that game result. In a free society, people do not require constitutional authority to act and conduct themselves. Only government does. Yet, notice how much we have to read between the law and make sense of constitutional interpretation these days to see if we are legally able to act as we would like, in accordance with our free will and the endowment of rights given by our Creator. We know something just isn’t right in this land established for individual liberty. Atheist groups claim that they can’t ride down a street or by a public square if they should see the word “Christ” or see a picture of a baby Jesus. They claim that it makes them uncomfortable. Judges, for some reason, see everything in terms of “religion” or “no religion” and fail to see any other possible implications, such as history or heritage. Nativity scenes at Christmas and crosses at Easter are hardly ever erected to promote one religion over another, but rather to educate and reinforce that certain holidays are grounded in a religious event. There are historical and traditional roots to our holidays and people have a right to know what they are. I, personally, see these symbols as paying proper respect to the holiday not as promoting a religion and maybe if people, and particularly judges, stopped thinking so myoptically, perhaps this country could maintain the integrity of the First Amendment as it was intended and stop the persecution of Christians. The Constitution was drafted to transfer a limited list of responsibilities from the States to the federal government. The Constitution was written for We the People, but was ratified on their behalf by the States. Under the prevailing theory of government, which is a social compact or contract theory, individuals already transferred some of their sovereign rights for security to their States, in return for an absolute protection of their rights which is why the States were the signing parties to the Constitution. The compact was an agreement by the States (on behalf of the People) to bound by the particular design of government. The Constitution contained a serious of “checks and balances” to curb abuse and centralization of power in any one branch of government, but more important was the ability of the States to interpose to prevent the government from assuming any power it was not delegated. And herein lies the most important reason for state sovereignty and states’ rights. The Constitution puts things into the proper perspective for people. The document is OURS to limit government and not the government’s to restrain the people. Too often we see government in terms of the latter. The Constitution is our prenuptial agreement. We don’t give up rights to the government just because of some relationship it may think it has. The Supreme Court, after the decision in Marbury v. Madison (1803), assigned itself the grand position of ultimate arbiter and interpreter of the US Constitution. The decision held that when the Constitution – the nation’s highest law – conflicts with an act of the legislature, that act is invalid and that determination falls within the domain of the federal court system. As such, with this case, the Supreme Court granted itself the power of judicial review. Anyone who fully understands the nature of the Constitution and the spirit under which it was written and ratified by the States, immediately comprehends the fatal flaw in that decision and the precarious situation we Americans have been put in as a result. The Supreme Court is itself a branch of government. Its judges are appointed under political circumstances and according to ideology that merely furthers a political agenda rather than necessarily protect the one thing that is most at stake – individual rights. So, in a dispute between the States and the federal government, the dispute is supposed to be resolved by which party??? The federal government? Under this arrangement, the States are clearly subordinated to the federal government; the interests of the States are clearly subordinated to the federal government; the concerns of the States are clearly subordinated to the federal government; and the interpretations of the Constitution are certainly subordinated to the interpretation by the federal government. As we can clearly see, and as Jefferson advocated strongly, it is impossible to comprehend that the States would have agreed to a system that assured their subordination. One only need look at the Court’s decision in McCulloch v. Maryland (1819) to see the implications of having the federal government resolving disputes over what the meaning of the Constitution should be. We were only on our third President and the Court was already making its own independent determinations as to how much power should be concentrated in the newly-created federal government. The McCulloch case centered around the meaning of the “Necessary and Proper” clause of the Constitution and looked to two Founders for the authoritative interpretation of its proper scope – Thomas Jefferson and Alexander Hamilton. Thomas Jefferson believed in a limited federal government with strong individual state governments. He was a strict constructionist who believed that every word of the Constitution makes a vital determination of power versus liberty. He said: “On every question of construction let us carry ourselves back to the time when the Constitution was adopted, recollect the spirit manifested in the debates, and instead of trying what meaning can be squeezed out of the text or invented against it, conform to the probable one which was passed.” Alexander Hamilton, on the other hand, believed in a strong central government. In fact, when he attended the Constitutional Convention in Philadelphia in 1787, he proposed a government modeled after the British monarchy, with a president appointed for life. Although he eventually embraced the Constitution adopted by his fellow delegates, and he gave proper assurances as to the true intention of the document in the Federalist Papers, he continued to believe that Congress should have more legislative powers than those expressly stated in Article I, Section 8 of the Constitution. The facts of the case are as follows: After an initial failed attempt to establish a National Bank 1791, Congress finally established one in 1816. Many states opposed branches of the National Bank within their borders. They did not want the National Bank competing with their own banks. The state of Maryland imposed a tax on the bank of $15,000/year, which cashier James McCulloch of the Baltimore branch refused to pay. The case went to the Supreme Court. Maryland argued that as a sovereign state, it had the power to tax any business within its borders. Furthermore, it objected to the establishment of a National Bank in the first place as an unconstitutional exercise of Congress’s power. Maryland argued: “The powers of the General Government are delegated by the States, who alone are truly sovereign, and must be exercised in subordination to the States, who alone possess supreme dominion.” The government, in response, argued that the people have, in express terms, decided that “this Constitution, and the laws of the United States, which shall be made in pursuance thereof, shall be the supreme law of the land.” (US Supremacy Clause, Article VI). It further argued that since the federal government was entrusted with ample powers on which the country depends, there must be ample means for their execution, and a national bank was “necessary and proper” for Congress to establish in order to carry out its enumerated powers, such as raising revenue, paying debts, etc. The question before the Court, then, (“the subject of fair inquiry”) was ‘How far such means may be employed?’ In other words, what is the proper scope of the Necessary and Proper Clause. Note that Jefferson nor the State of Maryland were challenging the supremacy of the Constitution. The status of supremacy was addressed in Federalist #33 (written by Hamilton) and Federalist #44 (written by Madison)] and was settled with the ratification by the States. The issue was the interpretation of the Constitution and the proper scope of powers. How broad would the Necessary and Proper powers be construed? Hamilton countered with a lesson on the meaning of the word “necessary,” just as Bill Clinton gave America a lesson on the meaning of the word “is.” [See fearistyranny.wordpress.com. Contending that his statement at his grand jury hearing that “there’s nothing going on between us” had been truthful because he had no ongoing relationship with Lewinsky at the time he was questioned, Clinton said, “It depends upon what the meaning of the word ‘is‘ is]. Hamilton explained that “necessary often means no more than needful, requisite, incidental, useful, or conductive to.” Contracts often include a term that provides some power to accomplish the goals of the agreement (a ‘necessary and proper’ clause, if you will), but Hamilton’s view was more that the Constitution is not an firm legal document but more of a “rubber” instrument, open to broad interpretations. In other words, it could be broad enough to be interpreted as Congress sees fit. Hamilton might just have been the father of the “living document” view of the Constitution. Jefferson was highly critical of the Marbury decision as violating states’ interests and destroying the balance of power between the states and federal government and by 1819 was growing ever more leery of the growing powers of the federal judiciary. The Court again rejected Jefferson’s view of a limited federal government and assigned another large grant of power to the federal government. Rideronthenet, a blogger, wrote: “Government tends to expand its own powers to the furthest extent tolerated by a majority of citizens.” So true. Marshall also noted an important difference between the Constitution and the Articles of Confederation. He wrote that the Articles stated that the states retained all powers not “expressly” given to the federal government. The Tenth Amendment, on the other hand, did not include the word “expressly.” He argued that this was further evidence that the Constitution did not limit Congress to doing only those things specifically listed in Article I. Notice three things with this decision: (1) The Court clearly failed to read the Federalist Papers and the transcripts of the State ratifying conventions, all declaring that the government would be limited in scope. (2) The power of a state to tax an entity of the federal government would be the “power to destroy,” as the Court noted. Yet the Court has no problem with the excess taxation of individuals. Excess federal taxation of individuals reduces the amount of taxation the state can morally levy on its inhabitants and therefore the state suffers at the expense of an excessively-funded federal government. (3). Hamilton’s views of a “flexible” Constitution were given improper weight, in relation to the overwhelming documentation to the opposing view, and by far more credible Founders than Hamilton. Again, Hamilton showed up to the Constitutional Convention to propose and promote the monarchist view of government. Americans just won their independence from a tyrant King George and Hamilton was pushing the very same system for America. He was the strongest advocate of a strong central government and the least committed to the cause of states’ rights. When he was unanimously and soundly rejected in Philadelphia, he stomped out of Independence Hall and went back to New York to pout. When the Constitution was written, although he had withdrawn from the Convention, Hamilton returned to sign it. He also noted that “he seemed to be very much out of step with the rest of the Constitution’s drafters.” When it seemed possible that two of the most powerful states in the Union – New York and Virginia – would not ratify the Constitution because it appeared to take too much power from the States, Hamilton stepped it up and wrote at least half of the Federalist Papers to explain the interpretation and scope of each section of the Constitution and to give assurances to those states still having reservations. So, knowing that the States were looking for the bona fide interpretation of the Constitution and were looking for assurances on which to ratify and assent to it, the Supreme Court decided to look past the spirit of the Federalist Papers and gave weight to Hamilton’s “personal” view that the Constitution should be read broadly. This would be the approach that the Court would take all too often in our history. Ironically, even Hamilton insisted, in Federalist #78, that unless the people had solemnly and formally ratified a change in the meaning of the Constitution, the courts could not proceed on any other basis. We saw the same type of misplaced emphasis and incorrect interpretation by the Supreme Court when it interpreted the Commerce Clause under FDR’s administration. We also saw how the Supreme Court applied the 14th Amendment, to the destruction of States’ rights, in disregard to the intent of that amendment. Religious rights have been eroded in a series of decisions stemming from this poisoned interpretation. And no doubt, marriage rights will be eroded in this way as well. An analysis of Supreme Court decisions from the founding of our country to the present will unfortunately show the American people that the Supreme Court very rarely referenced the Federalist Papers up until about 1930. By “very rarely,” I mean they were referenced about 4-5 times total in a 10-year period. The frequency increased in the 1960’s when the Court began to reference the Papers about 2 times each year. When William Rehnquist joined the Supreme Court as Chief Justice in 1968, there was a significant increase in the use of the Federalist Papers in deciding cases touching on the Constitution. So, we see the slow but constant erosion of the Constitution’s protection of liberty by the erosion of its fundamental and critical elements of check and balance. First, the Supreme Court elevated its power early on, in disregard to the assurances given by our Founders in Federalist #78 and Federalist #81, and then it almost completely destroyed the balance of power between the States and federal government with the 14th Amendment. From the very beginning, with Jefferson’s term as President, the Court and the other branches systematically concentrated power in the federal government and did so with a willing and an intentional blind eye to the assurances and warnings provided by our Founders (in disregard to their oaths). That being said, and that point hopefully having been made, we need to be concerned with the government’s growing hostility to religion and its ever-growing disengagement with the American people and its independent agenda. Judging by the trend in our nation’s history of government concentrating its power and making decisions it believes are “in the best interests of the county,” and the Supreme Court steadily stripping our rights, we should absolutely be concerned at the future of our freedom to exercise our religion freely. We are heading in a selfish direction, where individual pursuits trump general moral guidelines for strong individual and family foundations. We are heading in a direction where it is “cool” and acceptable to bash Christians. One look no further at the vile tweet that hate mongerer Bill Maher sent a few days ago attacking Tim Tebow for his public displays of faith (ie, his prayers before each game). Amoral lifestyles and hate groups are tearing down traditional institutions that have been place to promote stability and real human value in society. Christian religious groups are being harassed; schools are no longer the beacon of learning that they once were; and marriage is being attacked. For example, there are efforts to undermine the traditional status of “marriage.” Even President Obama announced that the government would not enforce DOMA (the federal Defense of Marriage Act). The executive branch is supposed to enforce the laws of the land. Challengers of traditional marriage want to remove the religious ties to marriage so that homosexual couples can enjoy the same status as heterosexual couples without feeling any ‘stigma.” But we all know that there are strong religious overtones and implications in marriage, which there should be. Without such, marriage would be treated merely as a contract, and the bonds of marriage are so much more sacred and important than that. The bedrock foundation of a strong moral society is a stable family unit with properly-defined roles and responsibilities. We are becoming a nation of conflict and of hate because we’ve allowed religion to be taken out of public life and out of our schools. When we go God’s way, we will necessarily bump into the Devil. So we have to be strong. We’re already taking on the government so maybe taking on the Devil won’t seem so bad in relation. At times, they seem to be one and the same anyway. Let’s continue to realize how important the Christian faith is to the integrity of this country and keep the pressure on and reflect and pray and find out how we can best advocate for our religious principles and at the same time for the principles that underlie and expand our liberty. A stand for religious principles is a stand for liberty. Thomas E. Woods Jr., Nullification, 2010, Regnery Publishing. First, let’s get the facts straight. Obama explicitly thanked God in his written Thanksgiving proclamation and closed his brief (three-minute) radio message with “God bless you.” He did, thus, “acknowledge” God, contrary to your assertion. You can rightly say, I suppose, that apart from all that he did not otherwise “thank God” in his radio message. Second, from that, you “think we are witnessing . . . [a] government which is growing HOSTILE to religion.” Really? I mean REALLY? Then you take on separation of church and state–or at least seem to do so. Separation of church and state is a bedrock principle of our Constitution much like the principles of separation of powers and checks and balances. In the Constitution, the founders did not simply say in so many words that there should be separation of powers and checks and balances; rather, they actually separated the powers of government among three branches and established checks and balances. Similarly, they did not merely say there should be separation of church and state; rather, they actually separated them by (1) establishing a secular government on the power of “We the people” (not a deity), (2) saying nothing to connect that government to god(s) or religion, (3) saying nothing to give that government power over matters of god(s) or religion, and (4), indeed, saying nothing substantive about god(s) or religion at all except in a provision precluding any religious test for public office. Given the norms of the day, the founders’ avoidance of any expression in the Constitution suggesting that the government is somehow based on any religious belief was quite a remarkable and plainly intentional choice. They later buttressed this separation of government and religion with the First Amendment, which constrains the government from undertaking to establish religion or prohibit individuals from freely exercising their religions. The basic principle, thus, rests on much more than just the First Amendment. Recognizing the foregoing aspects of the Constitution, you explain them as reflecting the consensus that religion was a matter best left to individuals and states. Okay. I agree with you that that was one of the reasons the founders separated the federal government from religion. Recognizing that the 14th Amendment later changed the powers of states over various matters and that the Supreme Court interpreted the 14th Amendment’s constraints on states to include the First Amendment’s constraints with respect to religion, you say nothing about whether the Supreme Court correctly read the 14th Amendment in this regard, and instead launch a broadside attack on the Court’s role in the constitutional scheme. Because the Constitution does not specify what the judicial powers encompass, that question needed to be resolved. Early in our nation’s history, it was–in Marbury v. Madison. In that case, the Supreme Court decided that it was the Legislature’s role to make the laws and the Court’s role to decide and declare what the law is in actual cases. The Court further held that in deciding what the law is with respect to the Constitution, the Court necessarily must decide whether a particular statute enacted by Congress conforms to the Constitution. I suppose the Congress or the President, co-equal branches of the government (comprised largely of founders at the time), or the People could have challenged the Court’s power to decide that it had the power it said it had, but they did not and instead accepted and ratified the Court’s decision. And now their collective decision is part of the bedrock of our constitutional law and history. You, I gather, don’t like that aspect of our nation and would like to turn back the clock and argue for a different approach (exactly what isn’t clear since our nation has never known any other approach). I agree with your overarching thesis that the founders would not establish a government that is inherently at odds with their religious convictions, which were largely Christian in nature. Moreover, given the republican nature of our government, I think it is only natural and expected that the laws enacted by our government–in both the founders’ time and today–largely reflect Christianity’s dominant influence in our society. That said, there is no reason to suppose that Christianity or theism is an inherent aspect of our constitutional government. Indeed, any such claim is antithetical to the constitutional principle against government establishment of religion. By founding a secular government and assuring it would remain separate, in some measure at least, from religion, the founders basically established government neutrality in matters of religion, allowing individuals to freely choose and exercise their religions and thus allowing Christianity (and other religions) to flourish or founder as they will. As noted above, it is to be expected that the values and views of the people, shaped in part by their religions, will be reflected in the laws adopted by their government. There is nothing in the Constitution that requires or calls for this; it is simply a natural outgrowth of the people’s expression of political will in a republican government. To the extent that the people’s values and views change over time, it is to be expected that those changes will come to be reflected in the laws adopted by their government. There is nothing in the Constitution to prevent this; indeed, just the opposite–the Constitution establishes a government designed to be responsive to the political will of the people. It is conceivable, therefore, that if Christianity’s influence in our society wanes relative to other influences, that may lead to changes in our laws. Nothing in the Constitution would prevent that–and moreover the establishment clause would preclude Christians from using the government to somehow “lock in” (aka establish) Christianity in an effort to stave off such an eventuality. Anyway, thank you so much for commenting and for your very well-presented thoughts and arguments. I actually don’t think we differ all that much in our views. I actually do believe religion is under assault in this country. And I absolutely do believe that the government is growing increasingly more hostile to the open exercise of religion. I’m not saying that it is an intentional snub on religion because I truly believe that most of our leaders are men and women beholden to their religious faith and their beliefs. I just think that the government has taken the notion of “Wall of Separation” completely too far. Everything seems to come down to an analysis of whether the particular conduct is an “endorsement” of one religion over another when many times that isn’t the primary purpose. But our courts and our collective mindset seem to gravitate always in that direction. Remember that while government can’t promote one religion over another, it also can’t promote “no religion” over “religion.” I’m sure you’ve read many a case involving religion where the analysis is just simply absurd. And while I do acknowledge that “Wall of Separation” is a bedrock principle of 1st amendment jurisprudence, I also believe and understand that it is technically a legal fiction. I wrote about the Everson v. Board of Education decision in another one of my posts – “THE JUDICIARY: The Supreme Court and Judicial Activism.” I also understand the reason why we need a separation of church and state. Jefferson indeed spent alot of time on that topic. Again, I just think we’ve gone too far and decisions have gone in the direction of the absurd. In most other decisions involving fundamental rights under the Bill of Rights, the Court has been sensitive even to the argument that rights are “chilled” because of some government position. These positions are not that there is an outright denial of rights but some minor incidental burden. Yet when it comes to the free exercise rights of religious groups (even the overwhelming majority, which Christians still comprise), there is no such deference. There was a horrendous Supreme Court decision last year out of California touching on this point. Again, I am thrilled that you took the time to post and again, to bring up some excellent points. I’m a conservative and a strict constructionist and so my point of view will always be from those angles. I believe that the one true way to update the Constitution to modern times is through the amendment process. I appreciate you thoughtful response and kind words.